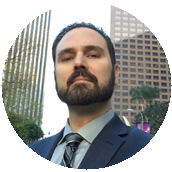 How My Court Reporters Grammar Saved Me Money | Todd Olivas & Associates v3.0 | Court Reporting Services in Orange County, Riverside, San Bernardino, San Diego, Los Angeles, Irvine, Santa Ana, San Jose, Sacramento, Fresno, San Francisco, Bakersfield. TO&A employs no court reporters, interpreters or videographers of our own. The providers we send are fully qualified and reliable independent contractors. Court reporting students often ask me, What's up with all this grammar knowledge? Why should we have to know grammar when all we do is take down what other people say? My answer is always a very firm -- because! Because you are going to represent our fine profession in front of well educated people -- attorneys and judges -- and you don't want to look dumb. Because it may come in handy some day...Not long ago I received a very important email from PayPal. A very important email, I tell you! For those of you who do not know, PayPal is an online processor of money. With my PayPal account I can make purchases and most importantly accept credit card payments for invoices. Since I've added the ability to pay for transcripts via credit card, my cash flow has improved, it's easier for clients than COD, and all in all things are grand. Under normal circumstances, your heart might skip a beat upon receiving such a notice. But as a trained court reporter, your Super Powers of Court Reporting Grammar kick in, and all your fears leave. And you'll have a good laugh too. This email is a fake. A fraud. It belongs in the trash. It was sent by someone claiming to be PayPal in an effort to get me to click on their bogus link to steal my user name and password. The process is known as phishing. Where my Outlook spam filters failed, my grammar skills kicked booty. Whoever sends these junk, thieving emails should have gone to court reporting school. Maybe their scam would work better. I've notated just five of the ridiculous things about this email with my red numbers. While this is not poor grammar per se, it sure smells fishy. PayPal is strictly an online service. So why would PayPal distinguish me as an Online Client? Are there Offline Clients? I didn't think so. My suspicion meter spiked. 2. 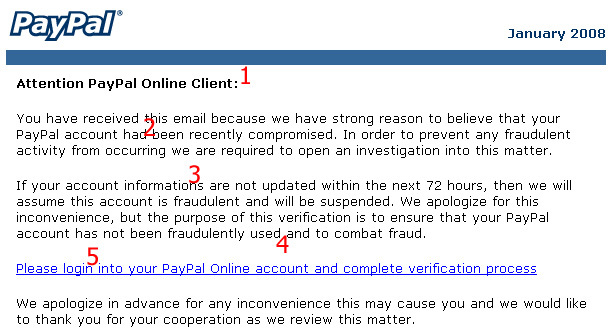 ...your PayPal account had been recently compromised. Not poor grammar technically, but surely the smart and educated people over at PayPal know better than to write in the passive voice. Had been is so yucky when it comes to business letter writing. Smacks of junior high grammar skills -- if you ask me. Ah, bad grammar paydirt. Mixing the singular account with plural informations makes my dog's eyes hurt. And my gramm-a-meter spiked off the charts. Oh yeah, informations is not even a word. My spell checker ixnayed on the informations-ay. 4. ...has not been fraudulently used and to combat fraud.What the #$@*?! My nine-year-old daughter would choke on her Cocoa Puffs at such a poorly constructed sentence. Once again, my court reporting senses told me that something was amiss. Hey, in the future, if you're going to try to steal my money, at least do it with proper English grammar skills. Sheeeesh. DOT NOT ATTEMPT TO GO TO THAT LINK. THEY WILL TRY TO STEAL YOUR MONEY WHILE USING HORRIBLE GRAMMAR ON YOU!!! It's a good thing to know grammar simply so you don't come across as dumb.